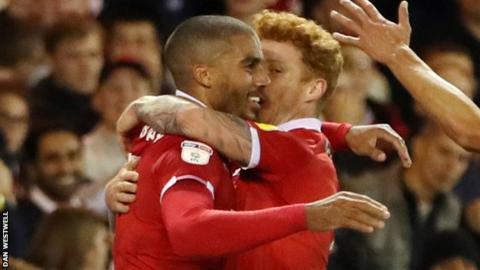 Lewis Grabban and Joao Carvalho scored their first goals since multi-million-pound summer moves as Nottingham Forest beat Sheffield Wednesday. Having come close a number of times, £6m striker Grabban ended an eventful first half with the opener as he headed home Ben Osborn's well-taken free-kick. Joao Carvalho, a club record £13.2m signing from Benfica, brilliantly curled home the second after exchanging passes with Osborn just after the hour. Steven Fletcher gave Wednesday hope late on when his shot took a heavy deflection to leave Costel Pantilimon with no chance, but the Owls could not find an equaliser. The win was just a second of the season for big-spending Forest, who leapfrog Wednesday into the top half of the Championship table. Wednesday, who had won three of their previous four games in the league, could have been behind after just 15 seconds as Grabban, a summer signing from Bournemouth, won a high ball and played in Matty Cash, who blazed over. Marco Matias headed just over for Wednesday before team-mate Atdhe Nuhiu was flagged offside as he headed Barry Bannan's free-kick into the net, while at the other end, Grabban headed wide under pressure shortly before opening the scoring late in the half. Wednesday forced Forest to defend well after the break, with Pantilimon saving from Nuhiu, but Carvalho's strike killed off their chances. The Portugal Under-21 international almost added a third, but his volley on the turn was saved before Fletcher's late consolation. "I'm very disappointed and I think over 90 minutes Nottingham deserved to win. "Steven Fletcher got a goal, but we didn't make any real chances today to win the game. "On the ball we were very poor, we had no passing, no combinations, no real chances in the last 30 metres, we weren't there." Match ends, Nottingham Forest 2, Sheffield Wednesday 1. Second Half ends, Nottingham Forest 2, Sheffield Wednesday 1. Jack Robinson (Nottingham Forest) wins a free kick on the left wing. Attempt saved. Ben Osborn (Nottingham Forest) left footed shot from the left side of the box is saved in the centre of the goal. Assisted by Joe Lolley. Attempt blocked. Gil Dias (Nottingham Forest) left footed shot from outside the box is blocked. Assisted by Joe Lolley. Offside, Sheffield Wednesday. Daniel Pudil tries a through ball, but Marco Matias is caught offside. Attempt missed. Adlène Guédioura (Nottingham Forest) right footed shot from outside the box is high and wide to the left. Assisted by Joe Lolley. Substitution, Nottingham Forest. Joe Lolley replaces João Carvalho. Attempt saved. Lewis Grabban (Nottingham Forest) left footed shot from the left side of the box is saved in the bottom right corner. Assisted by Ben Osborn. Corner, Sheffield Wednesday. Conceded by Saidy Janko. Goal! Nottingham Forest 2, Sheffield Wednesday 1. Steven Fletcher (Sheffield Wednesday) left footed shot from outside the box to the bottom right corner. Assisted by Marco Matias. Attempt missed. Marco Matias (Sheffield Wednesday) left footed shot from the left side of the box is close, but misses to the left. Assisted by Adam Reach. Substitution, Nottingham Forest. Ben Watson replaces Jack Colback. Offside, Sheffield Wednesday. Josh Onomah tries a through ball, but Marco Matias is caught offside. Attempt saved. João Carvalho (Nottingham Forest) right footed shot from the centre of the box is saved in the centre of the goal. Assisted by Jack Robinson. Josh Onomah (Sheffield Wednesday) wins a free kick in the defensive half. Substitution, Sheffield Wednesday. Daniel Pudil replaces Jordan Thorniley because of an injury. Attempt saved. Barry Bannan (Sheffield Wednesday) left footed shot from outside the box is saved in the top centre of the goal.